UNDERWOOD, Joseph Rogers, (brother of Warner Lewis Underwood & grandfather of Oscar Wilder Underwood), a Representative and a Senator from Kentucky; born in Goochland County, Va., October 24, 1791; moved to Barren County, Ky., in 1803 and lived with his uncle; attended the common schools and graduated from Transylvania College, Lexington, Ky., in 1811; studied law in Lexington; served in the War of 1812 as a lieutenant in the Thirteenth Regiment, Kentucky Infantry; admitted to the bar in 1813 and commenced the practice of law in Glasgow, Ky.; served as town trustee and county auditor until 1823; member, State house of representatives 1816-1819; moved to Bowling Green, Ky., in 1823; member, State house of representatives 1825-1826; unsuccessful candidate for lieutenant governor of Kentucky in 1828; judge of the court of appeals 1828-1835; elected as a Whig to the Twenty-fourth and to the three succeeding Congresses (March 4, 1835-March 3, 1843); chairman, Committee on Expenditures in the Department of State (Twenty-sixth Congress); chairman, Committee on the District of Columbia (Twenty-seventh Congress); declined to be a candidate for renomination; resumed the practice of law; presidential elector on the Whig ticket in 1844; member, State house of representatives 1846, and served as speaker; elected as a Whig to the United States Senate and served from March 4, 1847, to March 3, 1853; was not a candidate for reelection; member, State house of representatives 1861-1863; resumed the practice of law and also engaged in agricultural pursuits; died near Bowling Green, Ky., August 23, 1876; interment in Fairview Cemetery, Bowling Green, Ky. 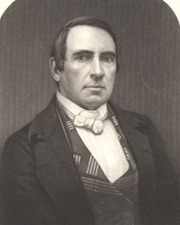 Dictionary of American Biography; Priest, Nancy L. Joseph Rogers Underwood: Nineteenth Century Kentucky Orator. Register of the Kentucky Historical Society 75 (October 1977): 386-403; Stickles, Arndt M., ed. "Joseph R. Underwood's Fragmentary Journal of the New and Old Court Contest in Kentucky." Filson Club History Quarterly 13 (October 1939): 202-10.